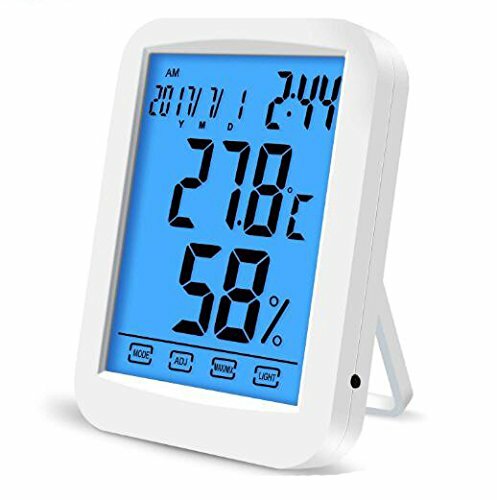 Big monitor range: Temperature -9.9℃~50℃(14℉~122℉) humidity 10%~99%, with accurate reading and max/min record of temperature and humidity in 24h/all time. Made of Eco-friendly ABS material, light weight and easy to mount on the wall by the hanging hole and adsorbed on the refrigerator by the magnet back, of course you can just place it on the table by the foldable bracket. Powered by 2 AAA batteries(not included). Please do not use this gauge outdoor because large air flow can lead to inaccurate measurement. Good to use it in all indoor spaces: Kitchen, living room, bedroom, reading room, bathroom, baby room, etc.